Are you missing teeth or unhappy with the ones you have? You’re not alone. Approximately 178 million Americans are missing at least one tooth. Dental implants are one of the most important modern advancements in dentistry. Dental implants only require a minor in-office surgical procedure, but transform your smile for a lifetime with minimal discomfort or downtime. A dental implant is a long-lasting, lightweight titanium post that replaces the root of the tooth. The post is placed in the jawbone just as the natural tooth root would be. 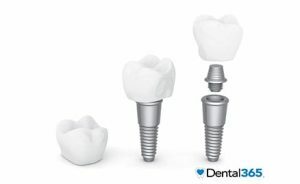 The implant is capped with a crown that looks and feels like a natural tooth. These parts work together as a tooth replacement system that offers many advantages including the prevention of bone loss in the jaw. The titanium post fuses with the living bone in your jaw by a process called osseointegration. This is what keeps bone loss to a minimum and keeps the implant in place and functioning for many years. As with all of your teeth, it is important to practice good oral hygiene to maintain your implants. Daily brushing and flossing is key. It is also important to see your dentist every 6 months. Special instruments are necessary to clean dental implants and your dentist will also need to monitor your implants to make sure the integrity of the osseointegration is stable, and that the implant crowns or bridgework are functioning adequately. Implant crowns and other tooth replacements are made to be reliable systems. They are replaceable by your dentist, so that if damage or wear necessitates replacement, this can be accomplished without affecting the implant(s) or attachment to the bone. Dental implants are the most reliable and cost effective way to replace missing teeth. The dentists at Dental365 are very experienced in dental implants and ready to speak to you about them. Make an appointment with your dentist today to learn more about restoring your smile with dental implants. Call 844-365-DENTAL to reach the Dental365 office nearest you.